A super easy and addictively delicious Fall treat perfect as a snack, dessert of brunch! Moist, just the right amount of sweet & YUMMY! If you’ve followed me a while, you know we adore my Mom’s Rhubarb Coffee Cake. It was a favorite growing up and we now make it gluten-free using GF Jules Flour (affiliate link) and every bite is as good as I remember… maybe even better. So excited because we adapted the recipe for Fall and this Apple Coffee Cake is out of this world! Maybe even better than the rhubarb one! And it’s still super easy to make! Perfect texture – very moist for a gluten-free goodie, perfect amount of sweetness, packed with tart and slightly juicy apples and the best cinnamon-sugar-walnut crumble on top! This is a must try especially during apple season. Perfect as a snack, dessert or brunch! Happy Baking! 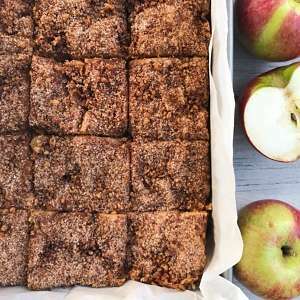 We adapted my mom's rhubarb coffee cake recipe for Fall and made it with Apples! Moist, not too sweet, packed with tart and juicy apples and addictively delicious! This super easy recipe is perfect for snacking, brunch or dessert! Prepare the Cinnamon Sugar Crumble by combining all ingredients in small bowl and set aside. Cream butter and brown sugar until well combined.